Rugged body-on-frame construction, powerful V6 engine power, and legendary 4X4 capability is a time-tested combination that’s tough enough for the trail, yet smooth enough for the city. The Toyota 4Runner allows you to bring even your biggest toys along on your weekend getaway, thanks to its 5,000-pound maximum towing capacity (when equipped). A spacious, well-appointed interior ensures that you and your crew will arrive at the campsite in complete comfort and style. Because every adventure has its own demands, an available sliding rear cargo deck provides an easy reach to your gear. The Toyota 4Runner brings tech to every outing thanks to the available Entune™ Premium Audio with Integrated Navigation and App Suite. From downtown to out of town, count on the 4Runner to tackle any challenge that stands in front of you. The Toyota 4Runner returns for the 2019 model year with only some slight updates. A new Limited Nightshade Edition joins the model lineup and features unique black interior accents, exterior mirrors, roof rails, side rocker panels, door handles, badging, and 20-inch alloy wheels. TRD Pro models also receive new enhancements including FOX shocks, revised roof rack, skid plate, and LED fog lamps. Take on the toughest trails with the Toyota 4Runner. 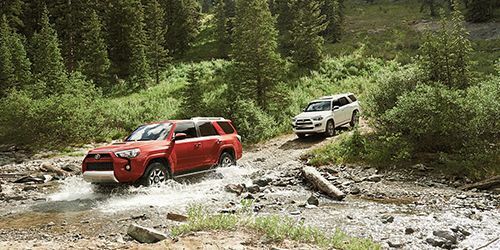 Up to 9.6 inches of ground clearance, an approach angle of 33 degrees and a departure angle of 26 degrees on 4Runner TRD Off-Road means you’re prepared to handle just about any obstacle. Optional Multi-terrain Select gives you the ability to choose from four modes that regulate wheelspin and braking pressure to provide maximum traction in off-road situations. Available Kinetic Dynamic Suspension System (KDSS) and Crawl Control (CRAWL) provide greater stability for low-speed, technical off-road maneuvers. While the 4Runner boasts a rugged exterior appearance, the interior feels exceptionally refined thanks to optional SofTex® or perforated leather seating. 40/20/40 fold-flat second-row seats provide up to 88.8 cubic feet of storage space or a mix of cargo and passengers. 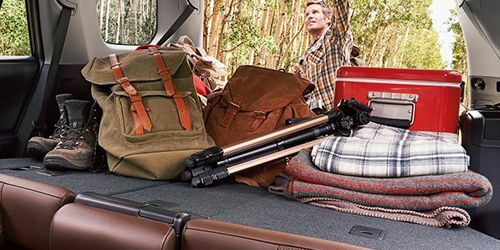 The Toyota 4Runner is the only SUV in its class that offers a power rear window that lowers for easy cargo access or filling the cabin with fresh air. A 120V AC power outlet is conveniently located in the cargo area to ensure you keep the things you need the most charged up. Up front, the instrument panel design is both intuitive and user-friendly, placing gauges and controls right at the driver’s fingertips. 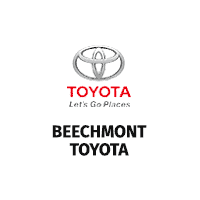 As you approach the Toyota 4Runner Limited with the available Smart Key in your pocket, the interior automatically illuminates, the doors and rear liftgate open with the touch of a handle, and the engine starts with a press of a button. Because every journey should have an iconic playlist to match, an optional 15-Speaker JBL® Audio System lets you hear your favorite music like never before. 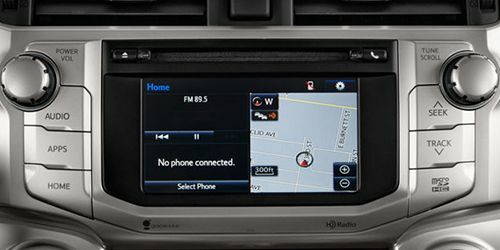 Optional Entune™ Premium Audio with Integrated Navigation and App Suite provides turn-by-turn directions along with access to your favorite apps including Facebook Places, iHeartRadio, Yelp®, and Pandora®. Each trim level of the Toyota 4Runner offers its own distinctive presence on the road. 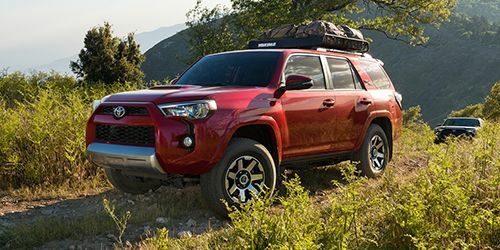 TRD Off-Road 4Runner models stand out with unique features such as 17-inch 7-spoke alloy wheels with black painted accents and TRD badging. Refined accents found on 4Runner Limited include an exclusive front fascia, chrome door handles and front grille, and stylish 20-inch split 6-spoke alloy wheels. Projector-beam headlights and LED taillights provide a distinctive look while helping increase visibility on the 4Runner.